Heat the oil in a frying pan and cook the onions for 10 minutes until soft and golden. Set aside until needed. To make the pancake batter, melt the butter, then whisk the eggs with the milk and melted butter. Place the flour in a bowl and slowly pour in the egg, milk, and butter mixture, stirring as you go until the batter is smooth. Heat the pan and when it is hot, pour in enough pancake mix to just cover the base of the pan. Cook for 1 minute on one side, then flip or turn it over and cook for another minute until just golden. Repeat until all the pancakes are made. You can stack them, but put baking parchment between them so they don't stick to each other. To serve, cook the sausages and heat up the cooked onions. 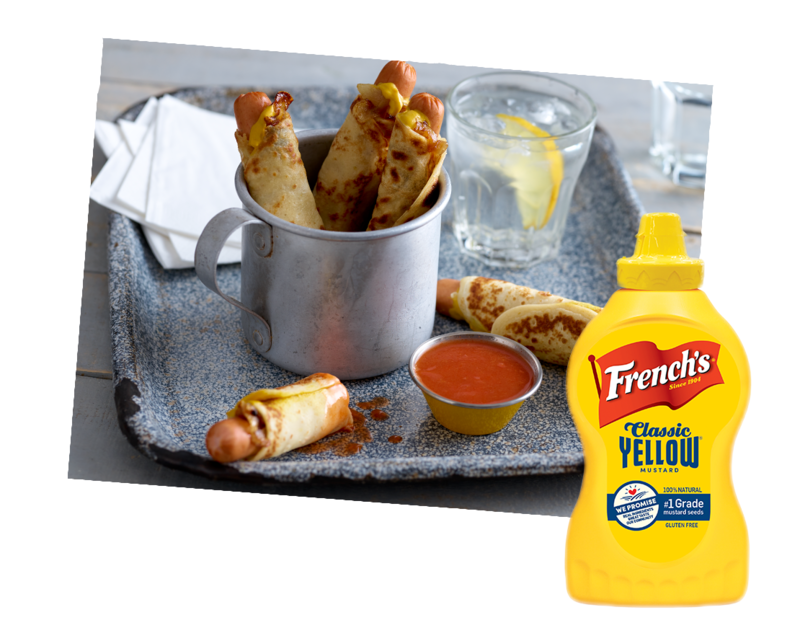 Spread a thin layer of French's Classic Yellow Mustard on the crêpe, top with the sausage, onions and roll up. Serve with ketchup for dipping.